Russell M. Woods is an attorney with Bramnick, Rodriguez, Grabas, Arnold & Mangan, LLC who has been engaged in the resolution of business disputes for more than 35 years. He represents individuals involved in a wide variety of conflicts, including corporate governance and ownership issues, unfair competition, fraudulent conveyances, issues arising out of business sales, and all manner of contract disputes. A significant portion of his practice also involves probate litigation, including will contests, accounting disputes, and claims about the conduct of estate representatives. 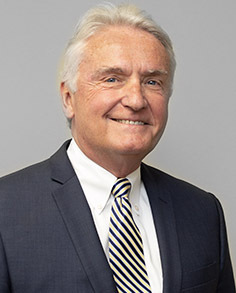 Mr. Woods has been at the forefront of the development and implementation of alternatives to litigation, including mediation, arbitration, and proceedings under New Jersey’s Alternative Dispute Resolution Act. He is often asked to serve as a neutral mediator or arbitrator and has lectured frequently on ADR topics for the N.J. Institute for Continuing Legal Education and other educational programs. His experience and reputation in the area of business dispute resolution has led to a number of court appointments, including assignments as receiver, special fiscal agent, and condemnation commissioner. He has served in the past on the N.J. Supreme Court Arbitration Advisory Committee and CDR Advisory Committee. He is currently a panel chair for the District XII Supreme Court Fee Arbitration Committee. Mr. Woods began his legal career as a law clerk to the Honorable George B. Francis, J.A.D., New Jersey Superior Court, Atlantic County, Appellate Division. Institute for Court Management, Washington D.C.